U.S. 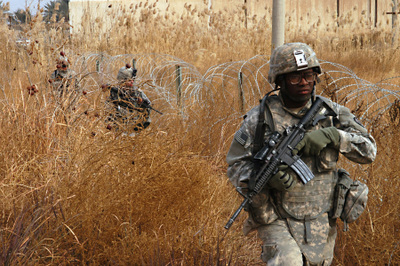 Soldier Staff Sgt. 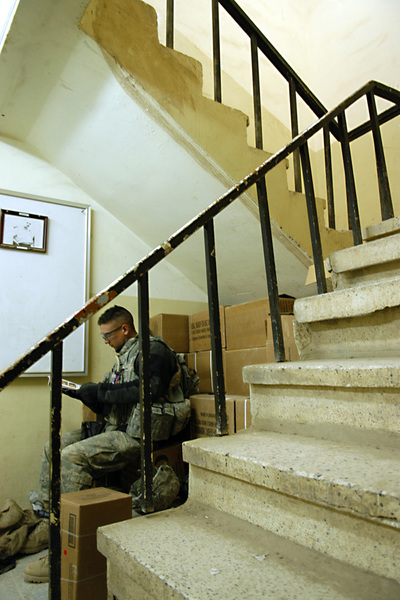 Robert Peredo of 1st Battalion, 14th Infantry, 2nd Brigade Combat Team, 25th Infantry Division, hailing from Dededo, Guam, prepares to load his weapon prior to departing on a mission to the Tarmiyah area of Baghdad on June 11, 2008. Capt. Jim Burton Headquarters, Headquarters Company, 1st Battalion, 14th Infantry Regiment Sends a graduation greeting to his son Jimmy at Mililani High School. We are approaching 5 months since we’ve left you, and though our rendezvous with destiny still continues our reunion with you still awaits. As many of you already know (see attached note), President Bush announced his decision to return to twelve-month theater deployments. Unfortunately, this decision will not affect the Golden Dragons. It will affect units deploying after 1 August 2008. I know that all of you held hope that there would be some reprieve bestowed onto our families, but what you need to know is – this decision was made possible by your Golden Dragon. It was by their hands that security improved in Tarmiyah, Iraq and the fruits of precious family time are given to others so they may RESET before return. This type of selfless sacrifice is an uncommon attribute among the world today. The average citizen getting a latte at Starbucks does not comprehend the profound sacrifice that you and your soldier endure. It is a fact, we Dragons are enduring the unendurable; our entire families are selfless servants to the Nation’s Mission – Provide security and stability to the people of Iraq, notions of freedom for those who may otherwise never experience these tenets. Now, the battlefield calculus is enabling sustainable security. We are doing this through two means - Securing the population where they sleep and developing Iraqi Security Forces (both Army and Police). We are fighting, too. When the International Zone (IZ) was pounded by dozens of rockets from Sadr City, thus killing and injuring both Iraqi and Coalition civilians, we were called upon to fight the Jaysh al Mahdi uprising in Sadr City and Bravo Company (Bushmasters) fought magnificently. In four hours, Bushmaster assembled from the most distant location in our battle space, rearmed and deployed to Sadr City. Many of you have seen their exploits on CNN, CBS and in the NY Times…these boys are the real deal. What you need to know is their success kept the Government of Iraq (GoI) intact. Sadr wanted to displace the GoI from the IZ, thus delegitimizing it. I well up with emotion when I talk about them. As I noted to you before, we must develop “waypoints.” The best waypoint is R&R Leave. We are 10% complete. Each month we will push 10% home and our program will end in November. I use a colorful analogy with the men to illustrate just how important block leave is – it’s like swimming out to a life buoy, you have to battle the ebb and flow of the tide, but you know when you get there you can rest before you swim back. Please ensure your team is developing routine contacts in the form of weekly mail, phone calls on the speakerphone, or a monthly VTC. Any method you choose…it’s all about contact. Notes and Photos are every bit a morale boost as a big care package. Sound Familiar? God Bless You - Golden Dragons! Captain Christopher Loftis, commanding officer of C company, 2/25 in Tarmiya, was trying to feel out a group of Iraqi men who hoped to join the Sons of Iraq movement. The men were standing around a checkpoint that flew the yellow flag of the Anbar Awakening movement at an intersection a few miles outside of town, and he was asking them how things were going. The response was the same each time: “more weapons” to fight the insurgents. Loftis would smile, shake the man’s hand, and move on. It was the usual request, always denied, but given that these men weren’t even under contract to provide security, the plea was a little premature. 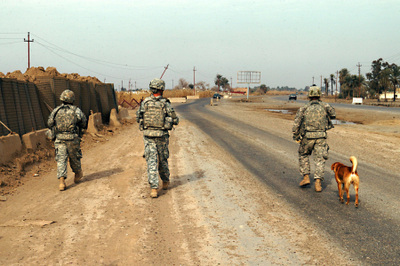 The captain had come out to this checkpoint in front of a former Saddam-era uranium processing plant not just to meet these men, but the men who organized them, along with about six hundred others who wanted a contract with the American Army to provide security. The Sons of Iraq program, begun in the spring of 2007 and funded by U.S. taxpayers to the tune thus far of $123 million and counting, is basically a private militia—80,000 strong at this point—hired by the American military to help fight the insurgency. Not surprisingly, the success of the SOI has produced conflict with the Iraqi government. At a meeting the day before with the local Iraqi police commander, the police complained that two people had been kidnapped and released by an “illegal checkpoint” manned by the SOI the night before, and that some of the men at these new checkpoints were wearing masks. The police commander wanted to make some arrests, which brought the American civil affairs officer assigned to Tarmiya, Major Guidry, to the edge of his seat. “Just get their names and give them to us,” Guidry warned. “We don’t want to put you in a position where you’re in conflict with Abna al-Iraq [Arabic for Sons of Iraq],” The police colonel frowned, but agreed not to do anything drastic. ... This rotation back to the big bases was how I got out to JSS Tarmiya, about thirty kilometers north of Baghdad. From Liberty, I caught a short helicopter ride north to Camp Taji, where I spent a night near an artillery battery (the 2nd Battalion, 11th Field Artillery Regiment, 2nd SBCT, 25th Infantry Division) firing illumination flares that rattled the walls of my room. The next morning I was placed in the hands of 1st Lieutenant Matt Ives, who was taking his platoon from Taji back to Tarmiya—home of the 1st Battalion, 14th Infantry Regiment, 2nd Stryker Brigade Combat Team, 25th Infantry Division. There was a bit of excitement before I left Taji however. While waiting to leave the dining area one afternoon, word started trickling back that someone had—just minutes before—lobbed two rockets at the base, and they landed about fifty meters away from the DFAC near the PX. One round hit the trailer containing the beauty salon, leaving a hole in the side of the structure, while the other landed nearby. One soldier got a few scrapes, but other than that, no one was seriously wounded. It was another example of how, even at the big bases, the war is never far. The ride from Taji to Tarmiya should take about thirty minutes, but ended up taking almost two hours due to route-clearance issues. Along one particularly dangerous stretch of road that was known for having IEDs placed along the route, a few soldiers had to dismount from the Strykers and walk the sides of the road, looking for the telltale wires. If you have any homecoming ceremony or reunion pictures you would like to share, please feel free to send them and I will post them here. MOSUL, Iraq -- Multi-National Forces from 1st Brigade, 25th Infantry Division (Stryker Brigade Combat Team), detained forty-two people during operations in northern Iraq on Jan. 22. Soldiers of 3rd Battalion, 21st Infantry Regiment, detained forty-one people suspected of anti-Iraqi activity while conducting cordon and search operations north of Mosul. Suspects are in custody with no MNF injuries reported. Soldiers of 1st Battalion, 14th Infantry Regiment, detained an individual suspected of anti-Iraqi activity in eastern Mosul. Suspect is in custody with no MNF injuries reported. Military officials have said the Mosul area is becoming safer with each seizure and removal of dangerous weapons and detention of anti-Iraqi insurgents. Since Jan. 5, Iraqi Security Forces and Multi-National Forces have detained 249 people and confiscated numerous weapons and munitions. Here is an excerpt from a longer article by Steve Fainaru in yesterday's Washington Post about our guys. Still, officers expressed optimism that their operation was having an effect and that voting would take place in Mosul. Asked about a Jan. 5 assessment by the commander of U.S. ground forces in Iraq that Ninevah, where Mosul is located, was one of four Iraqi provinces where it was still too dangerous to guarantee voter security, Ham said: "The security situation is better than it was yesterday. It's far better than it was 10 days ago, and certainly it's a world of difference than it was in the middle of November. But there's still a very capable and very dangerous enemy out there." The military's deployment of the 1-14, a light infantry battalion known as the "Golden Dragons," illustrates how far U.S. commanders are going to ensure peaceful elections and how their decisions affect the lives of American troops. 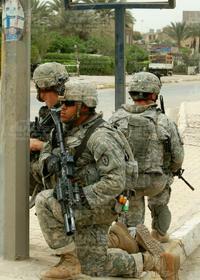 Since its arrival last January, the battalion has operated in nearly every hot spot in Iraq. It has been sent twice to Mosul and Najaf, as well as to Tall Afar and to Samarra, where it participated in an offensive to retake the city. Soldiers joked that 1-14 stood for "one place, 14 days." The Golden Dragons entered Iraq in open-air Humvees and literally walked into some of the most perilous corners of the war. 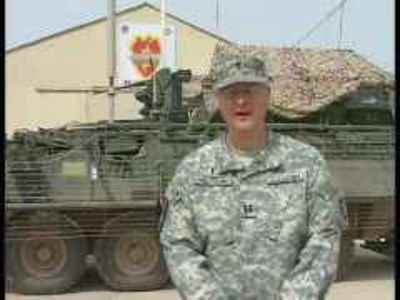 Although some have questioned whether troops in Iraq were given adequate armor, Capt. Jim Pangelinan, the 30-year-old commander of the Dragons' Alpha Company, called the debate "laughable." He said the battalion's boots-on-the-ground approach gave soldiers more flexibility and the opportunity to interact directly with Iraqi civilians. "You can't shake a guy's hand from a tank," said Pangelinan, a West Point graduate from Olney, Md. Slogging through the frigid Iraqi winter in Kirkuk last month, members of the unit were daydreaming of their impending return to Hawaii when they received orders extending their mission by 90 days because of the elections. Pangelinan, whose company is nicknamed "Reapers," jotted some notes and gathered his men to deliver the bad news. His task was to inform them that instead of going home to Oahu they had been ordered to a cold, restive city where, on Dec. 21, a man who was apparently dressed as an Iraqi soldier walked into a chow hall at a U.S. military base and detonated a bomb, killing 22 people. "Our road home leads through Mosul," Pangelinan told the soldiers. Pangelinan braced himself for the reaction. After he asked some sober questions about the mission, his men playfully attacked him, dousing him with water and then piling on top of him. Drenched and laughing, he felt relieved. "That's when I knew it was okay," he said. Last Saturday, 42 members of the unit gathered in a vacant lot inside Forward Operating Base Patriot and then, in a spectacle rarely seen in Iraq, marched straight out the front gate into the mean streets of Mosul. "I'd rather be out here, surrounded by my friends, than riding around in a vehicle that can blow up," said Agueda, 36, the company's senior noncommissioned officer. The platoon followed Agueda over the bridge, through a park, to an abandoned amusement park. There the soldiers fanned out near a roller coaster frozen in time and kiddie cars decorated with smiling faces. "Hey there's a tracer round coming from that octopus," someone joked. Then they walked back to their base.